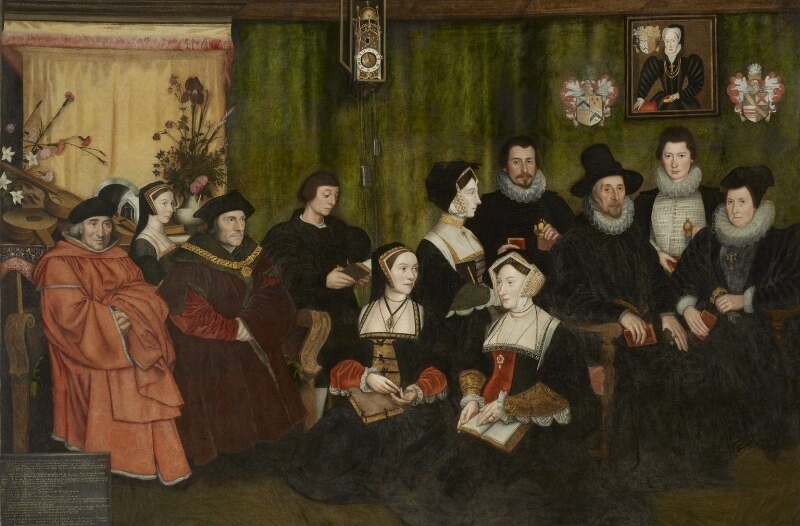 The following feature focuses on the Victorian period, but timepieces have appeared in paintings since the 1500s as demonstrated by the painting above of Sir Thomas More, his father, his household and his descendants. This oil on canvas, was painted by Rowland Lockey, after Hans Holbein the Younger, in 1593. The Victorian age in Britain saw history and religious painting—previously considered the highest forms of art—give way increasingly to a fascination with the everyday. Genre scenes or “subject paintings,” rich in narrative interest drawn from contemporary life, history, or literature, held sway over the public imagination throughout Queen Victoria’s long reign. At the yearly Royal Academy summer exhibitions of the period, the great proportion of pictures on display could be called subject paintings. As a reviewer of the 1856 exhibition commented, “If the picture is not a mirror it is a story.”(1) With this proliferation came great variety in the form and practice of narrative art in Victorian Britain. Many artists adopted an exacting realism, either in the manner of their painting or in the subject of their pictures, which they integrated with the revival of traditional iconography and symbolism. Drawing on the work of Hogarth, Dutch Golden Age painters, and literary sources, many Victorian narrative artists sought to find means to endow their realist paintings with artistic and moral power through a pervasive symbolism(2). Timepieces have a long history of appearance in genre paintings, both as narrative devices and emblematic objects carrying significance beyond their literal meaning as tellers of time. The clock was ‘the key-machine of the modern industrial age'(3) and became increasingly ubiquitous during the nineteenth century, in railway stations and on church towers, standing on mantels or hanging on walls, and increasingly, as personal objects. The inclusion of clocks in Victorian narrative painting took many forms, from the realistic to the symbolic. The status of clocks as common household items, inherently imbued with symbolic meaning associated with the passage of time, made them popular and recurrent visual motifs for Victorian narrative artists working in an increasingly time-conscious age. The first great flowering of genre painting in Britain had come early in the nineteenth century. The breakup of many notable collections during the Revolutionary and Napoleonic Wars in Europe led to an influx of seventeenth-century Dutch paintings onto the art market. Previously neglected in favor of Italian old masters, Dutch paintings, particularly seventeenth-century genre subjects, were now acquired in large numbers by notable collectors, including King George IV and the Duke of Wellington. This served to increase the popular appeal of such pictures to the growing industrial middle classes, particularly as their relatively small scale and unpretentious, moralizing themes made them fitting decoration for urban middle-class homes. A picture by Leiden artist Jan Steen was among the most notable works of Dutch seventeenth-century genre painting to enter a British collection in the years immediately following the Napoleonic Wars. A version of The Dissolute Household (Figure 1) was acquired by the Duke of Wellington on a visit to Paris around 1817. It is revealing of the style of Dutch genre subject painting popular in Britain in the early nineteenth century, carrying as it does a wealth of symbolic meaning via the many still-life details. Among these, a wall-mounted lantern clock features prominently. Timepieces, including clocks, pocket watches, and hourglasses, had long been popular motifs intended to remind the viewer of the brevity of life and the inevitable march of time. In The Dissolute Household,portraying a chaotic scene in an upper-class home, Steen draws particular attention to the wall clock by depicting a monkey playing with the weights. When combined, the traditional artistic associations of the monkey with man’s sinfulness and the conventional symbolism of the clock can be understood as alluding to the foolishness of wasting one’s short earthly life in the pursuit of pleasure, as enacted by The Dissolute Household. The Dissolute Household is by no means uncommon in the context of seventeenth-century Dutch genre painting. Pictures of this typeinfluenced the development of British narrative art long before the arrival of Steen’s painting in England in the early nineteenth century. In purely British terms the root of narrative art grew from the powerful influence of William Hogarth’s eighteenth-century Modern Moral Subjects. Through the proliferation of engravings, Hogarth’s works had become well known to the public and by the early nineteenth century their compositions, figures, and motifs had become an unconscious part of the nation’s visual vocabulary(4). Like Jan Steen, Hogarth was working in a period during which the new urban middle class was becoming increasingly dominant. The necessity for good moral conduct and strenuous work—vital to the existence of this middle class—was an idea underlying many of Hogarth’s most popular works. Steen, with his inclination for sarcasm and moralizing symbolism, was one of a relatively few artists from whom Hogarth actively borrowed definite motifs(5). 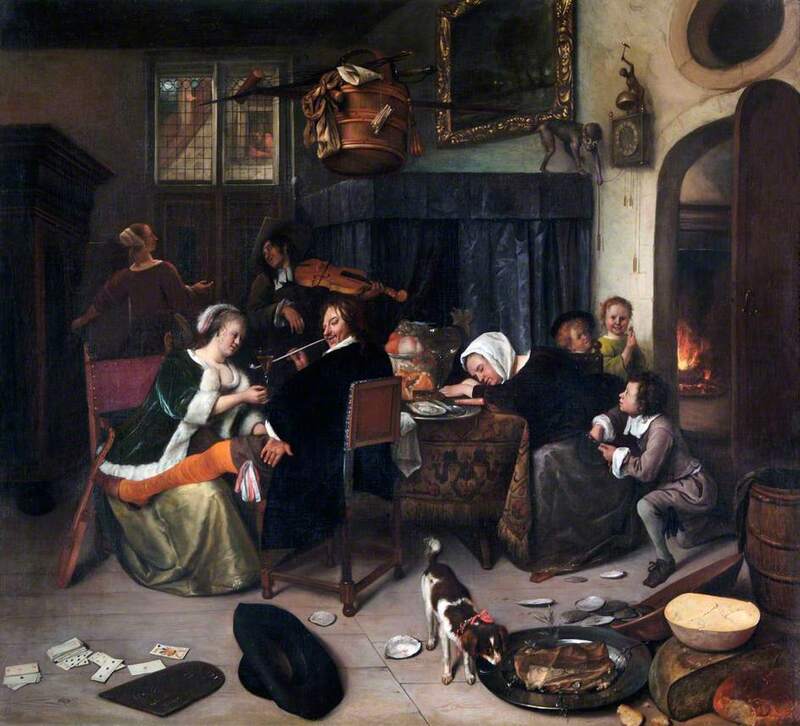 Of Hogarth’s works, A Midnight Modern Conversation (Figure 2) is perhaps most strongly influenced by one or other of Steen’s compositions similar to The Dissolute Household, both in overall composition and specific details. 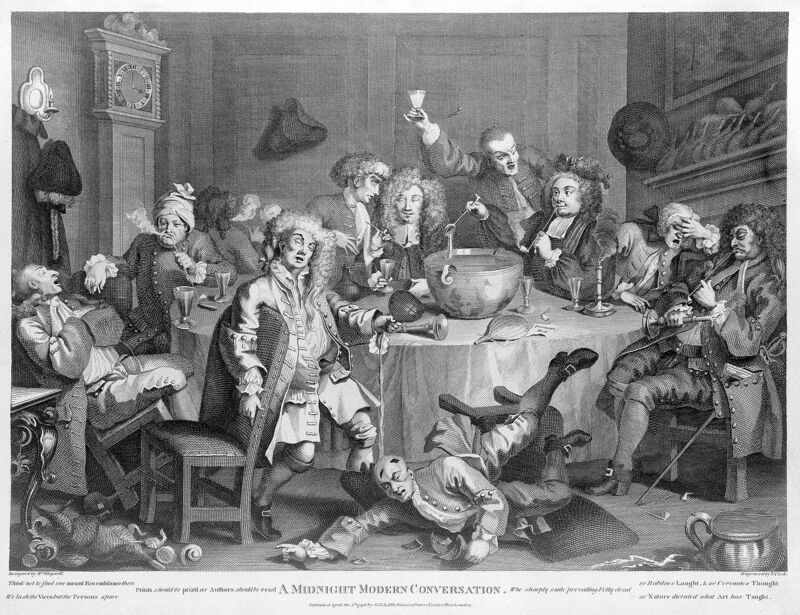 Hogarth’s engraving is set in one of the drinking clubs that sprang up in early eighteenth-century London to cater to a male clientele drawn from the middle and professional classes. The figures, seen gathered around a table dominated by a vast punch bowl, are depicted in a state of extreme drunkenness. As in Steen’s The Dissolute Household, a clock features prominently in the background and carries both narrative and symbolic meaning. While it undoubtedly illustrates the lateness of the hour, it is possible to go beyond this literal interpretation and argue that Hogarth borrowed from Steen the symbolic meaning of the timepiece. The clock can be viewed as a traditional Vanitas emblem—an object symbolic of the transience of life, the certainty of death, and the vanity of seeking earthly pleasure. Another traditional Vanitas object—the guttering candle—also appears in the scene. When viewed together, clock and candle provide the picture with a moral undertone characteristic of Hogarth’s satirical works. 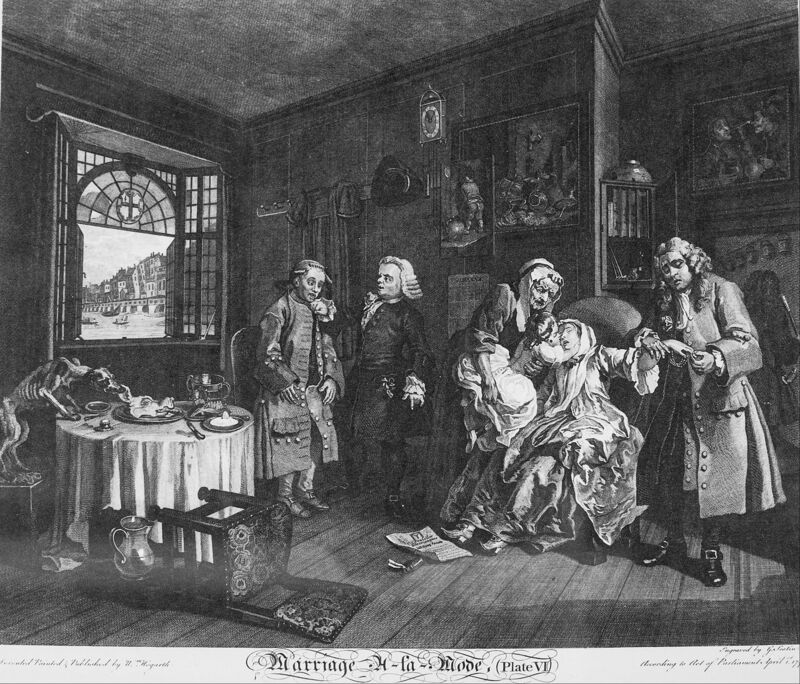 Clocks appear in a number of other works by Hogarth, notably in The Lady’s Last Stake(Figure 3) and in the sixth and final scene of the famous cycle Marriage A-la Mode (Figure 4). The Lady’s Last Stake depicts the moment when the female protagonist has to decide between financial and moral ruin after gambling away her fortune to a soldier, who offers to return her money and jewels if she accepts him as her lover. The clock on the mantel bears a small sculptural figure of Cupid wielding the scythe traditionally carried by Father Time, suggesting that accepting the soldier’s proposition would knell the death of the lady’s moral life. In this instance the decorative features of the clock supply an additional layer of symbolic meaning to that conventionally associated with timepieces. The symbolic function of timepieces in Victorian genre painting continued to be refined and utilized to varying degrees as British narrative art developed throughout the nineteenth century. During the first decades of Queen Victoria’s reign, literary sources provided narrative painters with some of the most consistently lucrative themes for their works. By far the most popular authors for this treatment were William Shakespeare, Oliver Goldsmith, Robert Burns, and Sir Walter Scott, with Charles Dickens added to the list in the second half of the century. Charles Robert Leslie was perhaps the greatest practitioner of literary genre painting in early Victorian Britain. 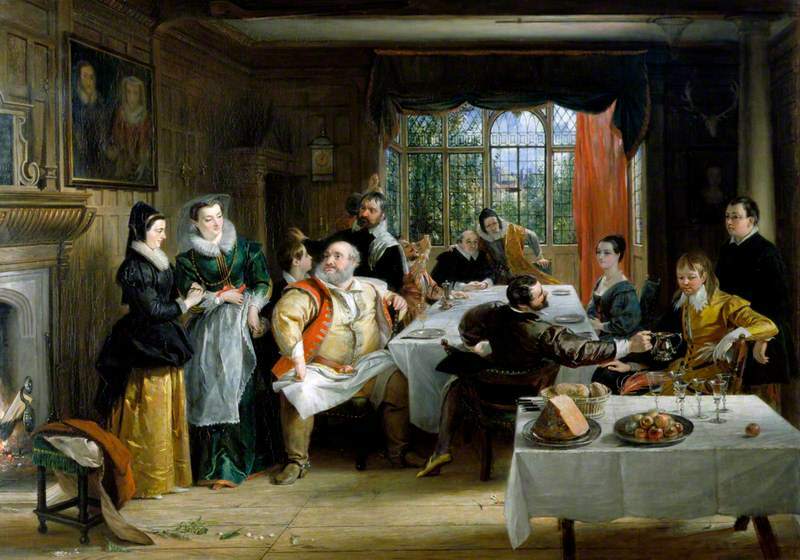 His 1838 painting The Principal Characters in the Merry Wives of Windsor (Figure 5) depicts Shakespeare’s comedic protagonists assembled for dinner. The lantern clock on the far wall can be understood as a reminder to the vain and boastful Falstaff, his dissolute companions, and even the scheming Merry Wivesto mend their ways while time remains. However, lantern clocks of this type, although common from around 1600, had since been replaced by the long-case pendulum clock(6). The lantern clock, therefore, like the timber paneling and mullioned windows, has not only a symbolic function but is an important part of the historicizing interior. In this context the narrative function of the clock outweighs its symbolic meaning. William Powell Frith is primarily renowned for his teeming depictions of contemporary Victorian life. However, Frith first gained success painting literary subjects(7). 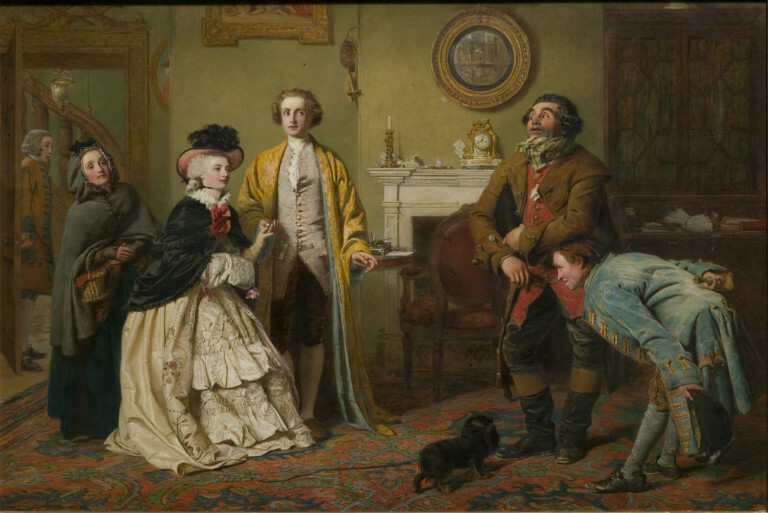 The painting, Mr. Honeywood Introduces the Bailiffs to Miss Richland as His Friends (Figure 6), is derived from a scene in Goldsmith’s comedic play The Good-Natured Man, first published in the mid-eighteenth century. In this scene the play’s protagonist Mr. Honeywood has been visited by the bailiffs, when his romantic interest, the wealthy Miss Richland arrives unexpectedly. He introduces the two men as his friends, rather than admit his financial difficulties. Frith’s scene draws on the work of Hogarth and his Dutch predecessors, both compositionally and in the caricature-like expressions of the figures. The French ormolu mantel clock embodies the aspirations of Mr. Honeywood, because mantel clocks were almost inevitably the preserve of the middle and upper classes in the nineteenth century. The clock also carries a multifaceted symbolism. In the conventional sense it is a reminder of the brevity of life, in this context as a warning to Mr. Honeywood to mend his decadent and foolish ways while time allows. However, the clock carries further meaning owing to its sculptural figures of Chastity restraining Cupid, from which derives an added symbolism that suggests Miss Richland is not deceived by Mr. Honeywood’s trick and that love will not blossom between them. The clock was not one of Frith’s usual studio props but was supposedly borrowed from his friend and fellow artist Augustus Egg for inclusion in the painting. It is possible that the French eighteenth-century style of the clock appealed to Frith as appropriate to the setting of his painting; however, the figures of Chastity and Cupid add an additional layer of symbolic meaning that would doubtless have appealed to Victorian audiences. Egg’s clock appears to have been sought after by his contemporaries, and its symbolic meaning is utilized again in William Holman Hunt’s painting The Awakening Conscience (Figure 7). The paintingis a modern moral subject in the tradition of Hogarth or Steen, rich in symbolic detail. It shows a gentleman and his mistress, whom he has installed in a house for their assignations. 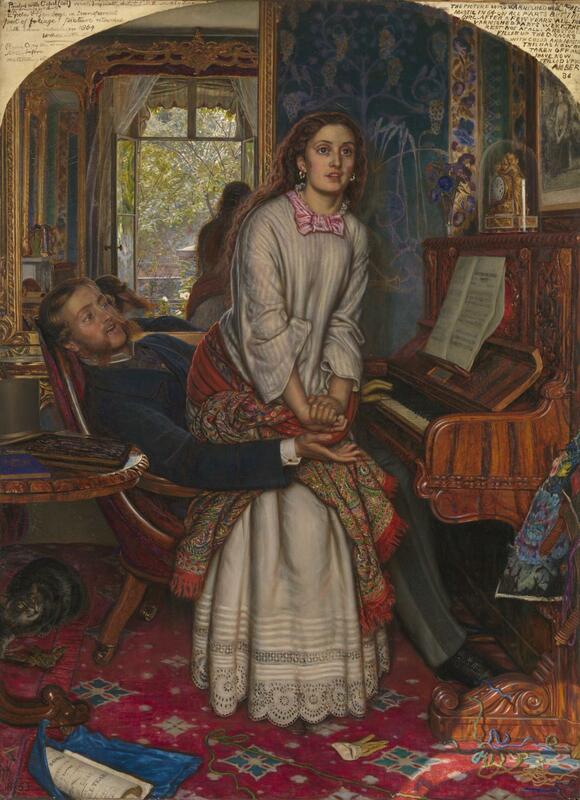 As they play and sing at the piano, she is struck by a sudden spiritual revelation and rises from her lover’s lap, while he sings on oblivious. In a manner popular with the Pre-Raphaelites, Hunt depicts his female protagonist enclosed within a room which, through the integrated symbolism, embodies her psychological and moral condition(8). 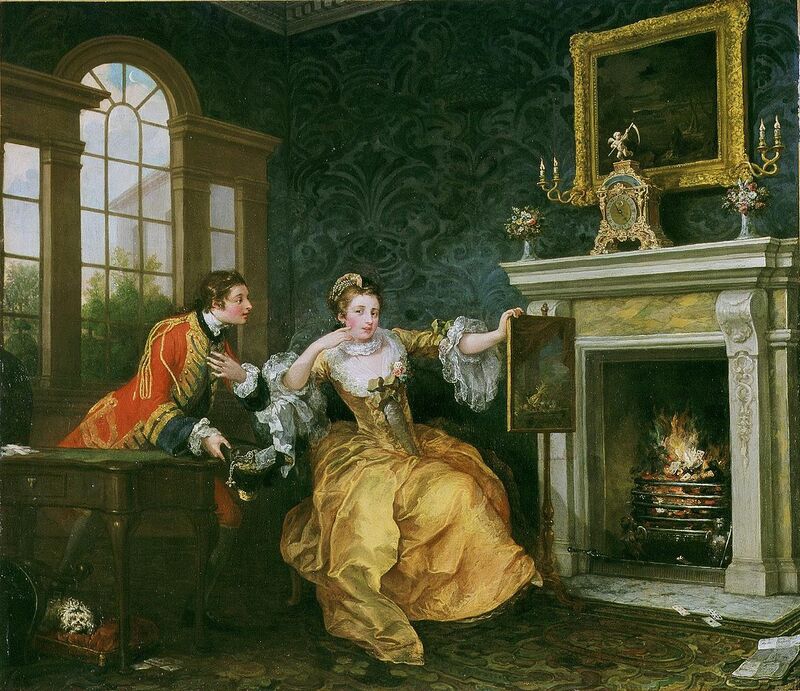 The cat toying with the bird under the table symbolizes her plight, while the man’s discarded glove at her feet warns that the most likely fate of a discarded mistress was prostitution, and a tangle of wool on the floor symbolizes the web in which she is trapped. The clock, which reads five minutes to 12 o’clock, signals the moment of crisis for the female protagonist, as well as fulfilling the familiar symbolic role as a reminder of the need to reform while there is still time. In the context of The Awakening Conscience and its pair The Light of the World,the figures of Chastity and Cupid personify the inward struggle of the woman between her material and spiritual lives. More generally, the ornate design of the clock is representative of the bourgeoisie society from which the young woman is struggling to escape(9). In both Hunt and Frith’s painting, just as in Hogarth’s The Lady’s Last Stake, the design of the clock serves to add an additional meaning, beyond the usual symbolism attributed to timepieces. That customary symbolism was utilized with particular effect by artists who were concerned with the problems of modern society, in particular the plight of the poor. One of the earliest paintings to tackle this subject was The Poor Seamstress (Figure 8) by Richard Redgrave. The original version of the painting is now lost, but a second version survives in a private collection, along with a preparatory watercolour sketch of the subject. Inspired by Thomas Hood’s poem ‘Song of the Shirt’, the painting drew attention to the exploitation of vulnerable working-class women in the clothing trade. 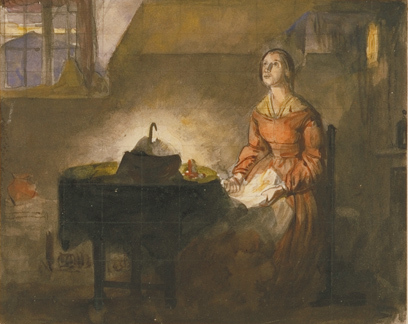 Redgrave’s Seamstress is a gaunt figure, working alone by candlelight, the clock on the wall behind her shows the time as 2.30 a.m., the dying plant on the windowsill and medicine bottle on the mantel attest to the unhealthiness of the work, while the broken basin and scant furniture allude to her extreme poverty. Redgrave seems to have decided on the clock as a significant motif in the early stages of work on the painting, because its relative form and position are already well established in the watercolor sketch, while other features were reworked for the final composition. As a narrative tool, the clock testifies to the long hours the seamstress is forced to work, while symbolically it is an emblem of inevitable and potentially premature death. Mothers with children were a recurrent subject for Victorian genre painters, particularly Social Realist painters. Infant mortality was high during the period, particularly though not exclusively among the poor, and anxious or grieving parents were a recurrent theme in the work of a number of artists. 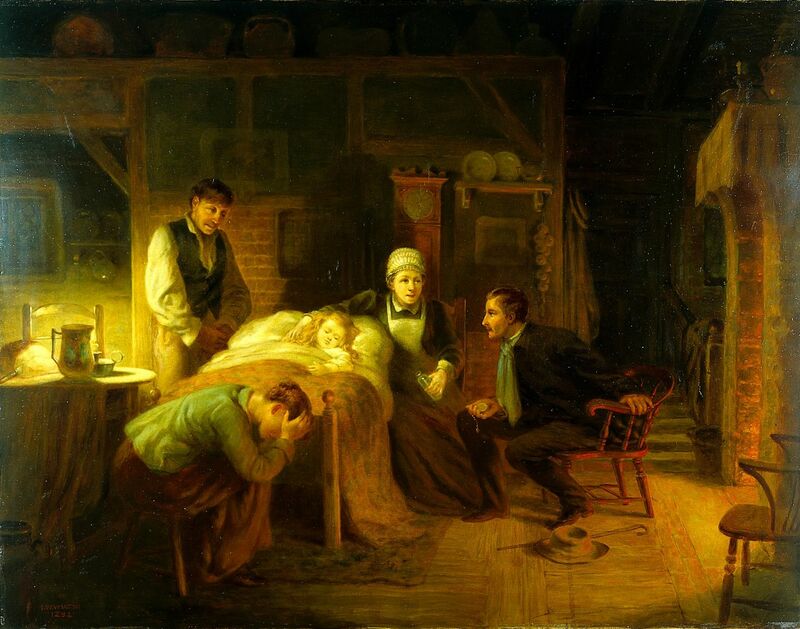 Little-known artist John Whitehead Walton’s treatment of the subject in his painting Anxious Moments (Figure 9)includes not one but two timepieces.The scene, set in a dimly lit domestic interior, is subtitled “A Sick Child, Its Grieving Parents, a Nursemaid, and a Medical Practitioner.” In the carefully observed interior, a long-case clock behind the Nursemaid shows the time as the early hours of the morning, suggesting that the child’s condition has deteriorated in the night and a doctor has been summoned. By including the hands and providing even a suggestion of the actual time, the clock imbues the painting with a particularity. A second clock, the pocket watch held by the seated doctor from which he seems to note the very moment of the infant’s death, is representative of the supreme moment of crisis and conventionally symbolic of death. The exacting realism of earlier generations of Victorian subject painters gave way in the 1880s and 1890s to a new type of British narrative painting inspired by French art.This new style rejected ostentatiously artificial subjects in favor of close observation of the humble and commonplace, painted in a looser manner in which the detail was sacrificed to overall form. However, a pervasive use of symbolism remained integral to British subject painting. As a consequence of the interest in French art, many painters moved away from London, and artists’ colonies, like that in the Cornish fishing village of Newlyn, became centers for this new strand of British genre painting. The Newlyn artists were fascinated by the working lives of the fishermen at sea and the everyday life of the harbor and nearby villages. The paintings of the Newlyn School were frequently concerned with the hazards and tragedies of the lives in the community. 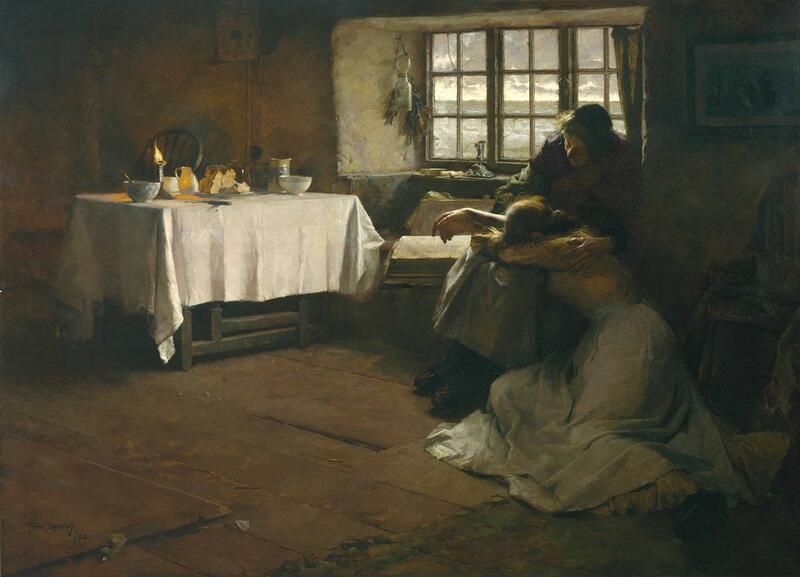 The wives of fishermen awaiting the return of their overdue husbands were a particularly popular theme among the Newlyn artists, made most famous by Frank Bramley’s A Hopeless Dawn (Figure 10).The paintingdepicts a domestic interior; the young wife of a lost fisherman is comforted by his elderly mother, as through the cottage window a dreary dawn breaks over the sea. The clock on the wall (to the left of the window) knells the dawn and with it the death of the missing husband. Its status as a traditional Vanitas device is reinforced by the candle on the windowsill that burned all night as a beacon but has just flickered out. The Impressionistic style of painting is symptomatic of French influence and more generally of the waning interest in subject painting in the final decades of the nineteenth century; however, the use of such conventional symbolism as that associated with the clock and guttering candle place A Hopeless Dawn firmly within the traditions of British genre painting. That an artist otherwise inspired by contemporary continental trends nonetheless chose to employ such a traditional symbolic device as the clock in A Hopeless Dawn demonstrates how deeply ingrained was such symbolism in Victorian narrative painting. British artists had inherited long-established symbolic conventions from the masters of Dutch genre painting, which were perpetuated in Hogarth’sModern Moral Subjectsand had become part of the visual language of subject painting in Britain. The innate visual symbolism of timepieces made them popular and perhaps surprisingly pervasive motifs for narrative painters wishing to imbue their realist art with a deeper and more enduring meaning while simultaneously providing their pictures with a particularity aligned to a single moment of crisis. The Leader. Royal Academy of Arts exhibition. London: Royal Academy of Arts, May 24, 1856, p. 499. George P. Landow. Victorian types, Victorian shadows: biblical typology in Victorian literature, art and thought.London: Routledge, 1980, 2015. Lewis Mumford. 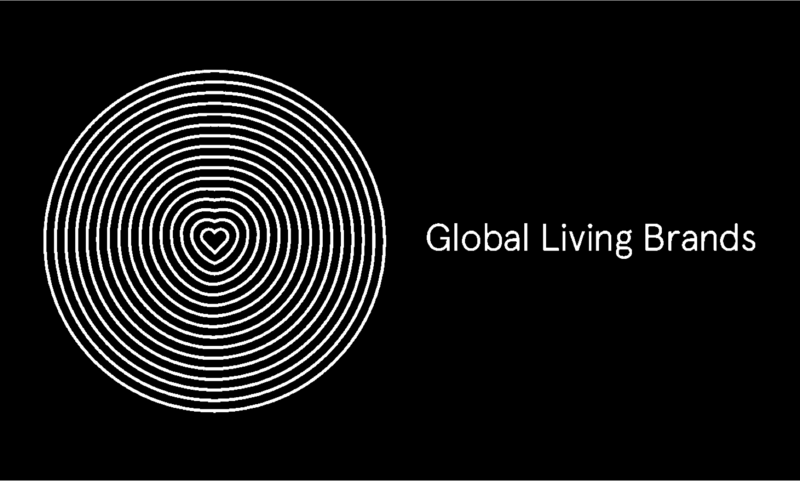 Technics and civilization. Chicago, IL: University of Chicago Press, 1934, 2010:14. H. M. Stationery Office, 1982:7. The Art Bulletin29, No. 1 (1947):41. Gavin Lucas. “The changing face of time: English domestic clocks from the seventeenth to nineteenth century.” Journal of Design History8, No. 1 (1995):2. Lambourne.‘Victorian’ genre painting: from Wilkie to Frith, 45. George P. Landow. Replete with meaning: William Holman Hunt and typological symbolism.New Haven, CT: Yale University Press, 1979. Accessed September 18, 2017. https://tinyurl.com/2rpj5n. S. Dillon. “Illustrations of time, watches, dials and clocks in Victorian pictures.” In The Victorian illustrated book, edited by Richard Maxwell, 52–90. Charlottesville, VA: University Press of Virginia, 2002. Used with permission. This article was originally published in the May/June 2018 (Vol. 60, No. 433) issue of the Watch & Clock Bulletin, a journal of the National Association of Watch & Clock Collectors, Inc. For more information about the Association and its membership benefits, please visit us at nawcc.org.